…and it helps me make treats. In the winter of 2010 I gave sewing a go and haven’t looked back. Since then I have been enjoying making aprons, napkins and hope to challenge myself by making clothes. This blog is where I will document my triumphs…and flops. 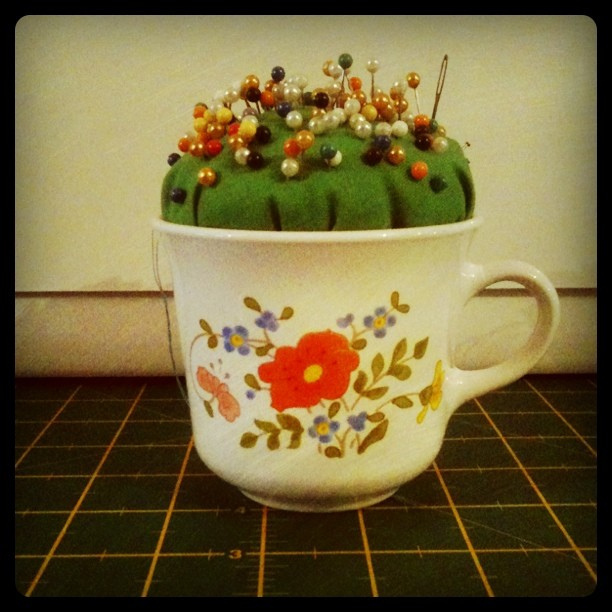 Stop by my shop and maybe find a pincushion treat of your own. Thank you for stopping my blog and liking one of my posts! I’ve been sewing for many years and I hope some of the information on my blog can help you. If there’s anything you’d like to see covered in a blog post, just let me know. I love your blog! You’re quite an accomplished seamstress! Lovely blog! Happy to follow you! Hi! I’ve been looking at your blog and your flikr page and I love the clothes you make! I was going to write a little bit about maternity clothing worn by Blake Lively, but now I want to include a bit about you and your blog! Please contact me and let me know if its okay for me to post your photos and link it to your blog- as well as write about you! 🙂 Thanks! Hi! Where do you blog? Id love to check it out. Cool! For some reason I was having trouble bringing it up. But finally got it. Feel free to link my blog if you’d like. Thanks for dropping by! Anyway, thanks a lot! It was my pleasure to drop by!